Don’t you hate when you’re starving beyond reason but the food choices around you are, in a word, lame? That’s what happened to me this past weekend at the Central Park Zoo. I took my nephew there for a visit with the penguins and mongoose and myriad other furry and slithery and winged creatures, but in the little cafe they have within in the fenced-in grounds, all there was on offer was lots of fried, breaded stuff of questionable origin, slimy looking hot dogs, and a vegetable panino that, wow, actually had me guessing at what, exactly, the veggie was. Bleh. 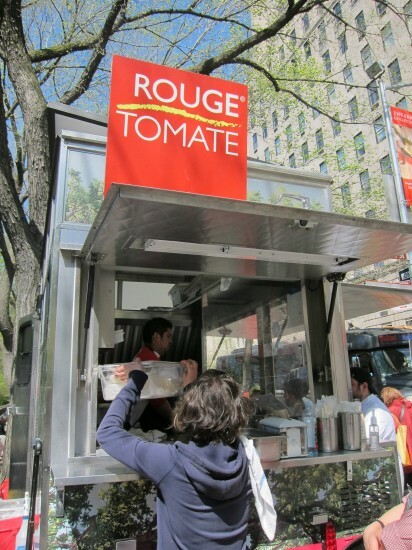 But the thing I wish I had known — and that I hope will be helpful for any of you venturing with little ones out to the fun CP Zoo in the coming warm-weather days — is that Slow Food-centric Rouge Tomate has their solar-powered, electric food cart set up right outside the entrance to the park at 64th and 5th Avenue! Which is exactly where you walk in to get to the zoo! Damn. If I’d known that ahead of time, I could have skipped the congealed, mystery veg sammy and gotten myself their marinated portobello ‘shroom burger, with feta from Riverhead, LI’s Goodale Farms, black olive tapanade, wild arugula, pickled red onions, and creamy cucumber tzatziki. Heed my warning and let my loss be your gain.